Suppose that you have a limited amount of data from which to obtain estimates of statistics for a population. 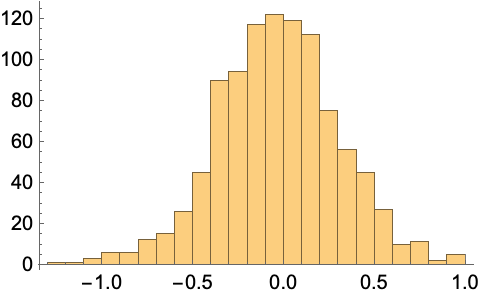 The sampling distribution for those estimates can be approximated by drawing new samples from the original data and then computing statistics from each sample. This process is called bootstrapping and can be performed in the Wolfram Language with RandomChoice. Assuming the original dataset is representative of the larger population it came from, then the resampled values should behave like a sample from the original population. 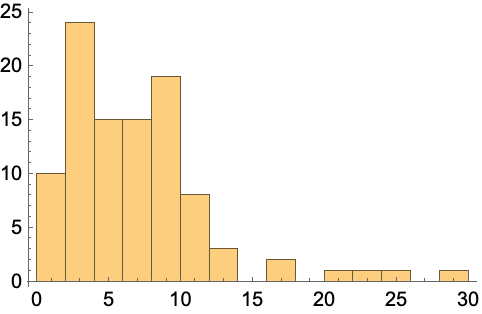 Statistics of a sample from the original dataset should thus simulate sample statistics for the population. By resampling from the original dataset several times and computing the skewness for each of these samples, you can approximate the sampling distribution for the skewness. The list of resampled values provides a sample space for the estimate, which is skewness in this case, so you can also compute additional statistics. More complicated results can also be bootstrapped, such as parameter estimates in a maximum likelihood fitting. It is often useful to obtain parameter estimates from a dataset, under the assumption that it follows a given distribution. For example, you may wish to use maximum likelihood to estimate the α and β parameters for the data generated from the gamma distribution. You can evaluate params many times to generate numerous estimates for α and β, thus giving a sample space for the parameters.